Based on a true story, this exciting account of the first successful rescue of a net-entangled whale is told from the whale's point of view, gently anthropomorphized to engage young chapter-book readers. 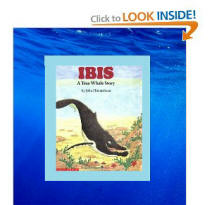 Ibis is a curious young humpback whale who loves starfish and playing with her good friend, Blizzard. At first the two are afraid of the boats that come to watch the whales, but they grow to enjoy swimming up to say hello to the smiling people. Then one day they see a different kind of boat. Without realizing what's happening, Ibis gets tangled in a fishing net, and though she manages to struggle free, part of the net remains caught in her mouth and wrapped around her tail. Over the weeks that follow, Ibis becomes ill. It's hard to eat, and even swimming to the surface for air becomes difficult and painful. Ibis lacks the strength to swim to warmer waters for the winter with the rest of the whales. Luckily, when she most needs a friend, Blizzard is there to help, pushing her to the surface where boats of human rescuers are waiting. Stop reading at Page 12 where the book offers a solution.